The following blog post is written by Mark Hawthorne regarding how companies use the term “cruelty free” casually. Being cruelty free doesn’t necessarily mean that they don’t use animal products, it just means that they don’t test on animals. We always have to be careful and mindful of the words that people use. Companies often exploit the loopholes for when it is free of something. Like Hawthorne says in his post, just because you’re vegan doesn’t mean you don’t use child labor. Just like if you’re animal cruelty free, it doesn’t mean you don’t use animal products or child labor as well. Take the chance to give this a read as it is a pretty good blog post regarding being cruelty free. “Earlier this month, Procter & Gamble Co., the corporate conglomerate responsible for the manufacture of everything from toothpaste to face moisturizer, announced it had joined with the Humane Society International’s (HSI) #BeCrueltyFree campaign, which seeks to ban animal testing for cosmetics in all major global beauty markets by 2023. This is certainly good news, as P&G has been notorious for blinding, burning, maiming, and killing thousands of animals such as rabbits, dogs, hamsters, and guinea pigs every year, all while testing the toxicity of product ingredients. If you are interested in learning more about animal cruelty, Mark Hawthorne has a blog where he talks about many topics regarding cruelty. One of the largest problems facing assistance animals is the growing prevalence of fraudulent cases. Because the ADA does not specify training standards for service dogs and ESAs, people have been able to falsely certify their pets as an assistance animal. Similarly, to how college students buy fake IDs, pet owners will buy fake certifications that come with harnesses, etc. so that their pets will appear like an assistance animal. Some of the things that we can do as college students is to educate ourselves on how to distinguish between service animals, ESAs, and pets. By knowing the difference of when we need to allow access and when we have the right to ask the animal to be removed, it can defer people to bring in fake assistance animals. For example, if you see a “service dog” in a shopping cart, it’s obviously not one. They are trained dogs so they will not do things like that. Their actions should speak louder than words. Real Service Dog manners, behavior, and training cannot be faked. It’s Minoru from the Animal Welfare committee. This November 27th, we are showing a film called Racing Extinction. We will start at 7PM in the Floyd Theatre. https://www.youtube.com/watch?v=MwxyrLUdcss is the trailer for the documentary. It’s a great documentary that has a lot of amazing footage of earth and the animal that live on it. It also has a lot of take aways to help our planet. Do you have any extra of these items? Well, look not further! 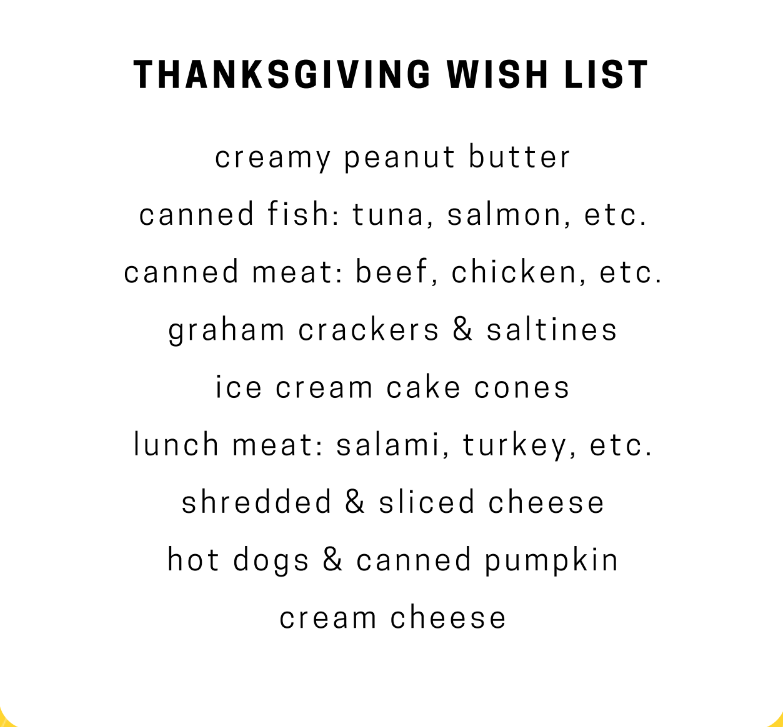 The shelter that we volunteer with is always looking for these foods. Please donate them to the ELSB office if you have any extra! My name is Minoru Chou and I will be this year’s new Director of Animal Welfare alongside Noah Barnes, the Associate Director. We both are very excited to be a part of the board again and hope to do a lot more with the committee than ever before! Like last year, we will be having weekly meetings but this year, we want to get our committee way more involved. One of our goals is to put a bigger emphasis on non-pet animals and focus a lot more on animals throughout our world. We hope that you are thinking about great ideas for this school year so that we can create events that engage and educate the UofL community! Don’t worry, everyone is koalafied to be a part of our committee and we hope to see you there! Let minnow if you have any questions or concerns about our committee, please contact us at minoru.chou@uoflelsb.org or noah.barnes@uoflelsb.org.